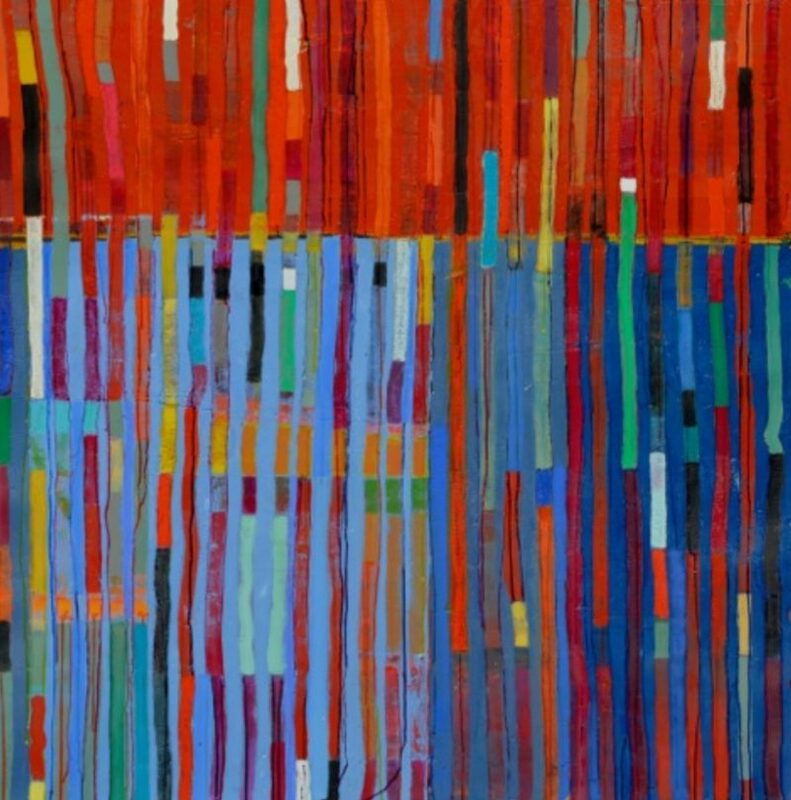 This month, Hollis Taggart Galleries will present Bill Scott: Leaf and Line, the artist’s seventh solo exhibition at the gallery, featuring twenty-five of Scott’s recent paintings. A catalogue accompanies this show with condensed critiques by eight contributors – artists, curators and writers – who offer very personal and inspired reactions to the painter’s lively compositions. 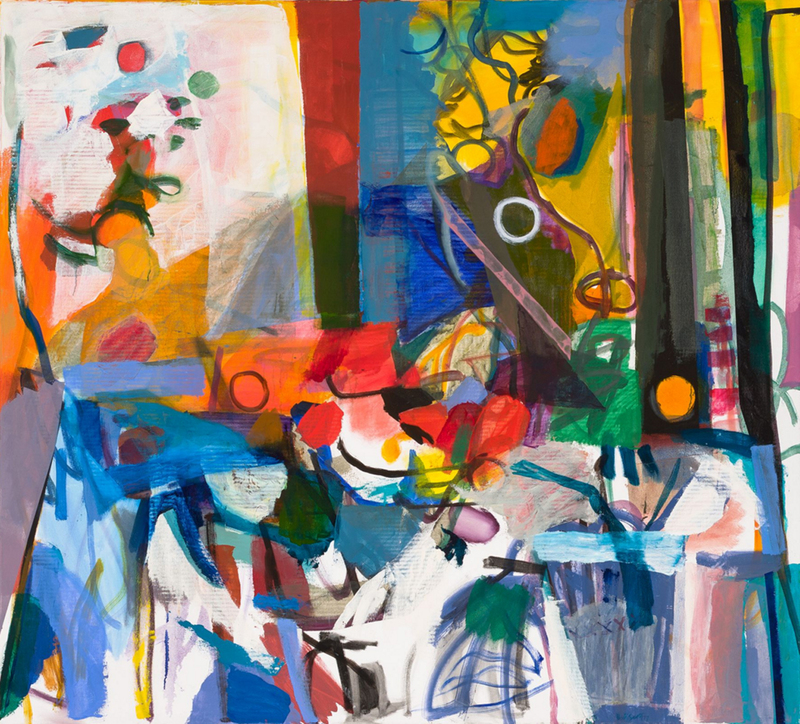 Bill Scott’s new body of work is rooted in his classic vibrant palette, fluid brush strokes and masterful balance of abstraction. Propelled by inspiration from nature, the painter continues his exploration of form and color in a fresh way. References to the natural world, details of leaves, blades of grass, branches and discernible elements of flora are boldly juxtaposed against areas of pure hues and spirited abstraction that dances with myriad details. The show once again is a testament to Scott’s imposing ability to dance the line between abstraction and representational, creating a tension in the viewer’s mind that asks the question; do we know this scene that is depicted before us? It is through this tension and this line of questioning that the viewer’s curiosity is peaked. Demonstrating the confidence and control of a seasoned painter, Scott’s most recent studio offering reveals a freer, more expansive pictorial space and use of white. The surfaces of the works are comprised of layer after layer of paint – a skill he has been honing his whole career. Complex, but never muddy, the overlapping elements in the paintings appear both spontaneous and carefully arranged at the same time. 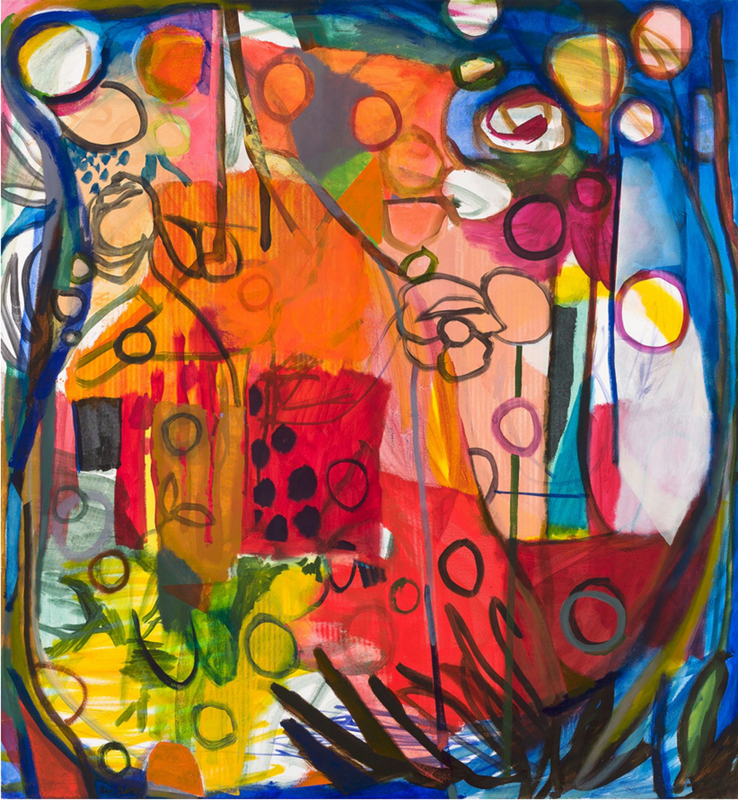 A Garden in the Studio bursts with energy and is like most of Scott’s work, an affirmation of the sheer joy of painting. 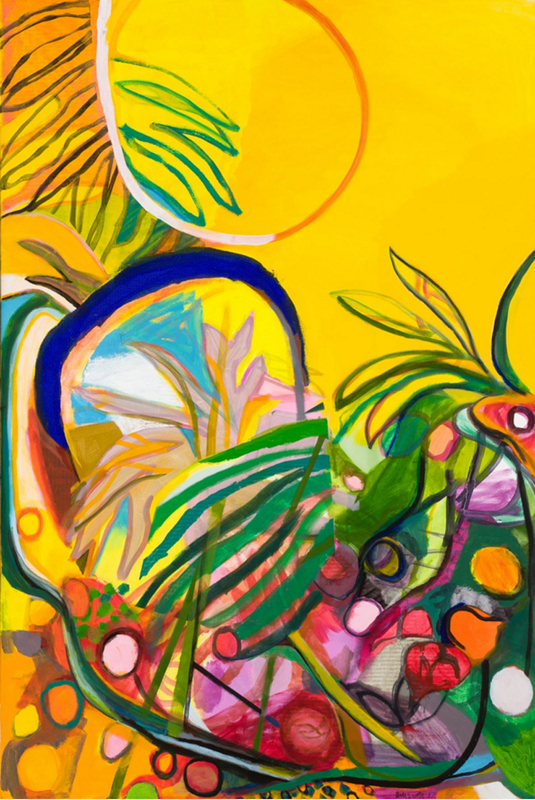 Similarly, in Leaf and Line, vague pictorial plant references are placed among undulating free forms of shapes and color and all set against a dramatic expanse of yellow in the upper quadrant. Harmony is always achieved with the painter’s virtuoso talent and pure intuition to combine hues, structure and movement. Scott, who lives and works in his native Philadelphia, spent what he considers to be pivotal periods of time working alongside Joan Mitchell in France and Jane Piper in Philadelphia. He formally began his career studying at the Pennsylvania Academy of the Fine Arts in 1974, an institution at which he was to become a teacher for many years. He is represented in countless museums, private collections and institutions, and he is a noted scholar on the work of the French Impressionist, Berthe Morisot. Thank you to Ginx Hudgins for the content of this post. This entry was posted in Art, Art Galleries, DoNArTNeWs, Fine Art Philadelphia, NYC Galleries, Oil Paint, One-Person Art Show, Paintings, Paintings Philadelphia, Philadelphia, Philadelphia Abstract Art, Philadelphia Art, Philadelphia Artists, Philadelphia Artists, Uncategorized and tagged abstract art, Art, art gallery, Art Installation, Berthe Morisot, Bill Scott: Leaf and Line, Chelsea, DoNArTNeWs, DoNArTNeWs Philadelphia Art News Blog, Hollis Taggart Galleries, Jane Piper, Joan Mitchell, NYC, oil paintings, paintings, Pennsylvania Academy of the Fine Arts, Philadelphia, Philadelphia Art, Philadelphia Artist, Philadelphia Fine Art on March 11, 2018 by admin1. 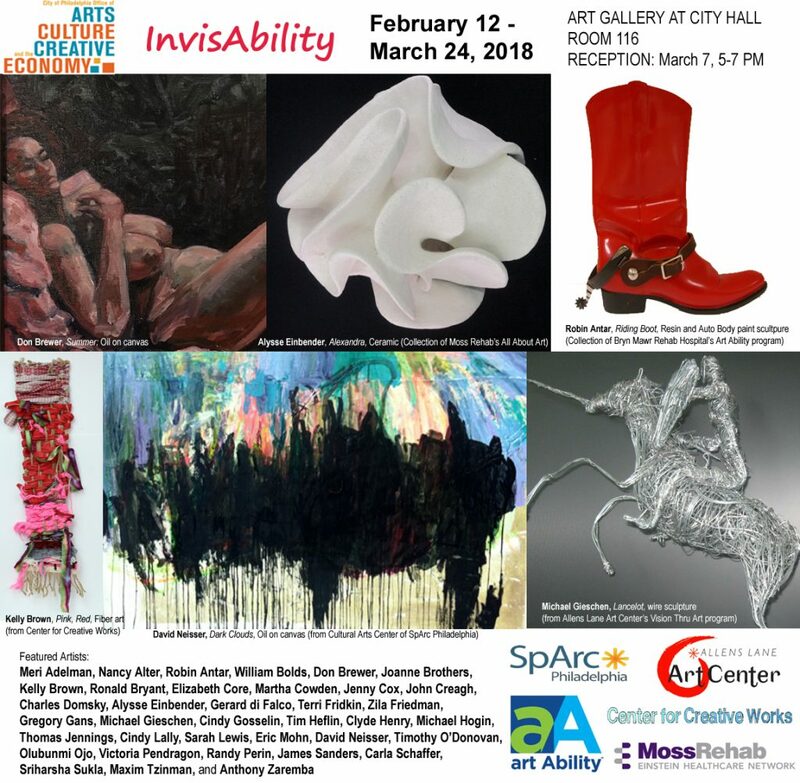 InvisAbility runs thru March 23rd. Thank you to City Hall Exhibitions Manager Tu Huynh for the content of this post. This entry was posted in Art, Art Ability, Art Galleries, Art History, Art in Philadelphia, Art in Philadelphia City Hall, Art Spaces Philadelphia, Assemblage, Ceramics & Sculpture, Collage, DoN Brewer, DoNArTNeWs, Drawings, Experience Design, Fine Art Philadelphia, Installation, Mixed Media Art, Office of Arts, Oil Paint, PA Art, Paintings, Paintings Philadelphia, Philadelphia, Philadelphia Abstract Art, Philadelphia Art, Philadelphia Art Galleries, Philadelphia Art Installations, Philadelphia Art Shows, Philadelphia Artists, Philadelphia Artists, Philadelphia Photographers, Portraits, Pottery, Prints, Public Art, Sculpture, Social Practice, Uncategorized, Watercolors, Works on Paper and tagged abstract art, Alysse Einbender, Anthony Zaremba., Art, Art Installation, Carla Schaffer, Charles Domsky, Cindy Gosselin, Cindy Lally, Clyde Henry, Culture and the Creative Economy, David Neiser, DoN Brewer, DoNArTNeWs, drawings, Elizabeth Core, Eric Mohn, Gerard di Falco, Gregory Gans, InvisAbility, James Sanders, Jenny Cox, Joanne Brothers, John Creagh, Kelly Brown, Martha Cowden, Maxim Tzinman, Meri Adelman, Michael Gieschen, Michael Hogin, mixed media art, Nancy Alter, Olubunmi Ojo, paintings, Philadelphia, Philadelphia Art, Philadelphia Art Gallery, Philadelphia Art News, Philadelphia Art Shows, Philadelphia Artist, Philadelphia Artists, Philadelphia Fine Art, Philadelphia photography, Photography, Randy Perin, Robin Antar, Ronald Bryant, Sarah Lewis, Sriharsha Sukla, Terri Fridkin, The Office of Arts, Thomas Jennings, Tim Heflin, Timothy O’Donovan, Victoria Pendragon, William Bolds, Zila Friedman on February 23, 2018 by admin1. A solo exhibition of new oil paintings by artist Katherine Fraser on view February 23 – April 21, 2018. In her third solo exhibition with the gallery, Katherine Fraser draws inspiration for Far from the Tree from fables and explores what it means to have control over our own destinies. Universally-known stories and endings are suddenly given the ability to change. The artist’s most cohesive series to date, each character is presented with the agency to alter their own outcomes. 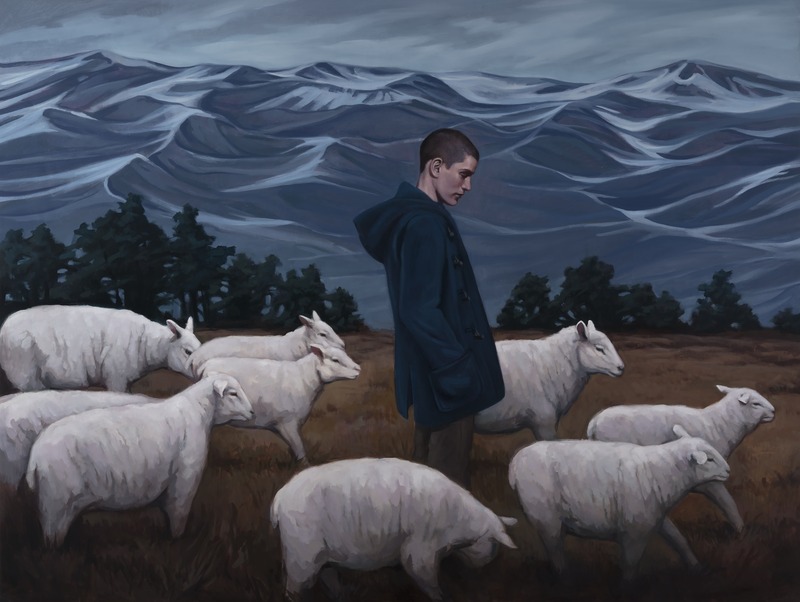 Fraser’s figurative compositions ‘depict moments of quiet reflection and insight, of wonder, vulnerability, yearning, determination, humility, strength, and growth’. She cites realist painters Edward Hopper and Bo Bartlett as influences, but also sees parallels between her work and photographers like: Diane Arbus, Mary Ellen Mark and Sally Mann. All of these artists act as storytellers, capturing individuals in moments and settings with a great deal of intimacy. 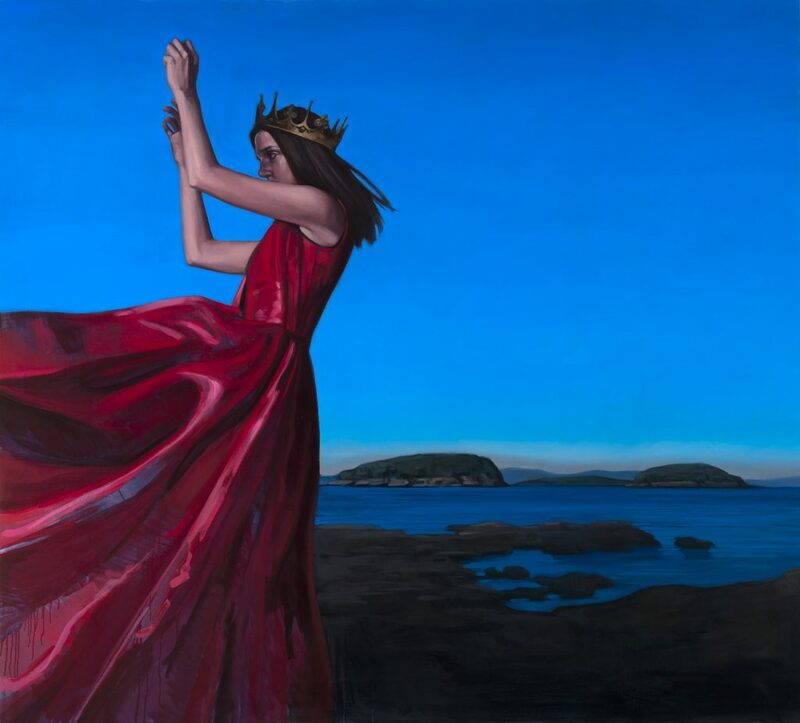 Classically trained, Fraser exclusively works with oil paint for its flexibility and luminosity, striving to make her paintings beautiful, but also to emotionally engage with the viewer. Fraser likes to draw attention to dynamic and conflicting emotions within individual characters. In her overall practice she seeks to portray ‘our continual need to reckon expectations with truth, and the struggles we endure to feel satisfaction with our choices’. change the narratives of our own lives”? founders and curators, Jason Chen and Sara McCorriston, to create a space to make artwork, exhibit the work of their peers, and invite the members of the local community to make their own artwork in a welcoming gallery setting. Over the years, Paradigm Gallery + Studio has become a gallery of diverse contemporary artwork from around the world, while maintaining a focus on Philadelphia artists. States. She is a graduate of the Pennsylvania Academy of the Fine Arts and of the University of Pennsylvania. As a student she received the Thomas Eakins Painting prize, the Cecelia Beaux Portrait prize, and the William Emlen Cresson Memorial Travel Award, among others. Since graduating in 2002, she has received awards including the Lucy Glick Award and the Victor Klein Family Award. Her work has been published in Studio Visit Magazine, Philadelphia Weekly, Die Blumen die Frauen, The Fertile Source, New American Paintings, The Southern Review, the Best of American Oil Painting, and more. 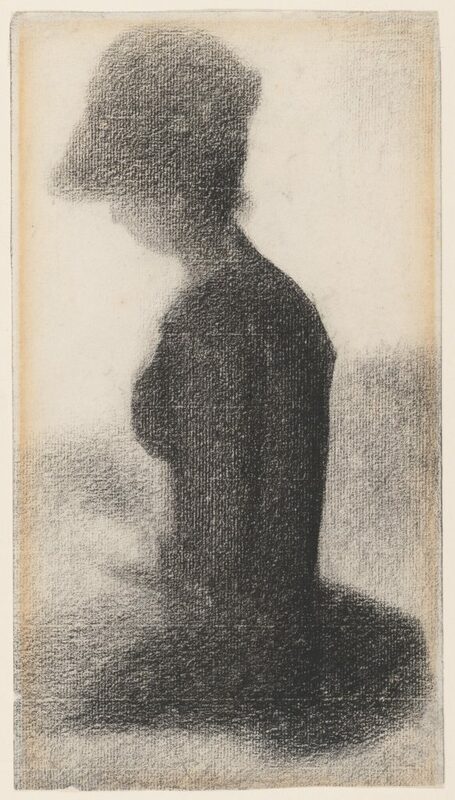 Her work may be found in many permanent and private collectionsmnationally and abroad. This entry was posted in Art, Art Galleries, Art in Philadelphia, Art Spaces Philadelphia, Fine Art Philadelphia, Oil Paint, One-Person Art Show, PA Art, Paintings, Paintings Philadelphia, Paradigm Gallery & Studio, Philadelphia, Philadelphia Art, Philadelphia Art Galleries, Philadelphia Art Installations, Philadelphia Art Shows, Philadelphia Artists, Philadelphia Artists, Uncategorized and tagged Art, DoNArTNeWs Philadelphia Art News Blog, Far from the Tree, Katherine Fraser, oil paintings, paintings, Paradigm Gallery & Studio, Philadelphia, Philadelphia Art, Philadelphia Art Gallery, Philadelphia Art News, Philadelphia Art Shows, Philadelphia Artist, Philadelphia Artists, Philadelphia Fine Art on February 13, 2018 by admin1.